What: With the theme of “Integrated Data centers: Engine for Bimodal IT Strategy”, the summit gathered over 150 senior IT and business executives to share how virtualization, Cloud, and big data will drive the evolution of their data center strategies. 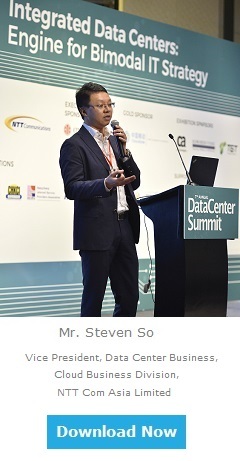 Discusses the key issues and trends affecting future enterprise data center strategies, especially in relation to the unique data center market and business environment in Hong Kong, as well as explores the value of high-density colocation and how visibility of data center infrastructure and management can support enterprises in the age of digital transformation. NTT Communications has commissioned a survey to reveal the critical factors that Hong Kong-based IT decision makers consider when selecting a potential data center service provider, and understands the aspects of data centers that they consider drivers of satisfaction. Read the full report now to learn how to choose the right data center service provider! Mr. Raymond Ng newly joined us to oversee retail, logistics and supply chain management solutions, as well as service development, technology consultancy and global supply chain visibility project implementation. Mr. Ng has over 23 years of experience in the industry with deep knowledge in consulting services for global IT service providers.